"Yes, I did play the psychotic. so unthinking and diabolically cruel?" At sixteen he wanted to be an artist, but was rejected by the Vienna Academy of Arts. He found lodgings in a poor house, where he painted, listened to Wagner's operas and became anti-semitic. In World War I for gallantry on dangerous missions, he was twice awarded the Iron Cross. He was hospitalized with temporary blindness, a reaction to mustard gas, and a military psychiatrist diagnosed him as hysterical and psychotic. Leaving the army he became a party activist and firebrand speaker for what was later the Nazi Party and in 1921 became Führer (Leader). The week before this recorded interview took place, the Masters told us that they would ask the soul-who-was-Adolf-Hitler to appear fully in character for the first part of our discussion, and then speak with us in his true soul-self in the second part. PETER I personally survived seven bombs the German Luftwafte dropped close by in 1942. PETER Eight year old boys were conspiring against you? HITLER Everyone was conspiring against us. Some of our strongest supporters were boys of that age. PETER Making money from selling your paintings was extremely hard. In fact you became homeless. Was that a display of your talents? HITLER My talents went to people, not to pigment art. The role of artist let me examine all sorts of people without them realizing. (A CELL PHONE GOES OFF AT THIS POINT.) What an annoying contraption. Is it some kind of eavesdropping device? PETER Your mother died of breast cancer when you were eighteen. Was the cancer caused by your attitude? HITLER (ALMOST SHOUTING AND GLARING FROM LEFT TO RIGHT) I don't know what you're talking about! If you truly believe that energy can create disease in the body, then, yes, it was. She put herself in a position to absorb those energies. I wanted to be rid of her sniveling accusations of my worthlessness. She did not see who I was. PETER Did you ever embrace the idea that you wanted to be evil? HITLER No, I wanted to be powerful. I wanted to create a perfect race of people. I wanted to go back to the true Aryan blood that came at the time of the early Celtic religions. PETER Were you ever in love with Geli Raubal and Eva Braun? HITLER I don't know that I truly ever had a love of another human being. I had a love of power. I had a love of being the one in charge, who dictated, who wrote the manuscript. PETER Did Geli commit suicide, or did you shoot her? HITLER I shot her. She had begun to become a clinging liability. She talked too much. PETER What caused you to be so strongly opposed to the Jewish people? HITLER They were deceitful, they were sly, they took advantage of people, they weren't to be trusted, they weren't truthful. They hoarded the money and wouldn't let it outside of their race. There was one banker to whom I went for help. He laughed me out of his office because I wasn't the "right type." PETER Did you fancy blue-eyed, blond-haired young German men? Were you bi-sexual? PETER Are utopias created with the blood of millions of people who die at some dictator's hand? HITLER Yes, if those people are not fit to be part of the new society. They are the foundation upon which we can rise up and build. They are the fertilizer for our crops. PETER What were your biggest mistakes: Churchill's Britain, the Eastern Front or declaring war on America? HITLER Getting America involved. I grossly underestimated what they would bring to the table. Toni remarks: There is a shift, a definite change in the energy. It is not the force we've just been talking to. PETER Now that you are back Home, do you see yourself as the incarnation of absolute evil? HITLER The person whose part I was playing was what a human would consider as "absolute evil." But I am no different from any other soul who plays a part in order to learn physical lessons and to help others with their lessons. I was selected and agreed to be a despicable despot, and others' to be my victims. PETER Tell me why the choice was made. HITLER Something had to change in the consciousness of the planet. We had to put forth to the masses the necessity for compassion throughout the planet. We came up with this idea to provide a framework for compassion from that point on throughout human history. So it was arranged that I would be a ruthless, immoral, psychotic. PETER Why does the Creator permit such a decision to be made? HITLER You are creating a god-form outside of humanity; as most of the religions do, a man in a white beard. But that which is "God" is the energy within all of us. Each of us is a piece of all creation. There does not have to be a consent by one Person, one Soul-God. It is the agreement of all of the energy, whom some of you call the "God-Force,"
PETER So was this experiment, conducted with the approval of millions of souls, a success? HITLER Yes, for the majority of those in human form since then. They have been able to feel the abject evil, the abject hopelessness of the victims. That has created a compassion for those placed in a situation totally beyond their control. PETER What does the Creator achieve by permitting evil? HITLER To be able to experience and know the greatness of what we are. We cannot truly comprehend unconditional love unless we know what the absence of unconditional love is like. PETER But at a huge price! HITLER That is your perspective. No soul was killed for this lesson. The soul is eternal. Those, who went through a physical transition, will have a different perspective themselves when they choose to return. Toni comments: This dialogue was truly a weird experience. 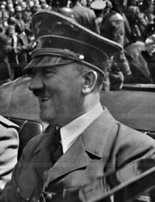 In part one Hitler's persona was very threatening and very dynamic. He was hugely restless, with his paranoia seeping out all over. There was an underlying fearfulness permeating everything. The voice I heard was sharp, caustic, and accusatory. In part two, the soul energy appeared as a humble, serene, compassionate, older soul, seeking to explain the unexplainable to our disbelieving human sensitivities. To learn more about Hitler, please click below - as well as on Talking with Leaders from the Past above. You may also be interested to read about the victim's side of the "contract". If so please go to the Anne Frank link or for the full account order Talking with Twentieth Century Women.